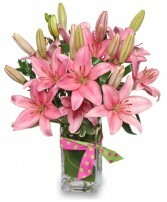 The perfect expression of love and sweet affection, this Valentines Day bouquet is ready to send your hearts every wish straight to your recipients door with blooming beauty. 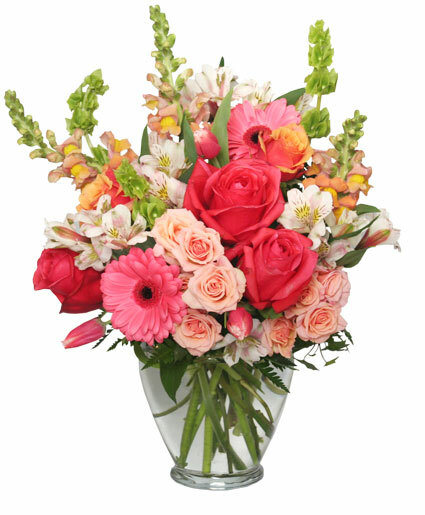 Rich red roses are surrounded by a collection of ruffled blooms including hot pink carnations, red mini carnations, purple statice and fuchsia mini carnations, perfectly accented with lush greens. 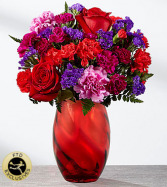 Presented in a stunning red modern glass keepsake vase, this gorgeous bouquet is ready, set, and styled to celebrate love this coming February 14th.